Sometimes it's fun to make a quilt from color combos you'd never choose yourself. I'm making a quilt for my sister for Christmas. She requested navy, aqua, and coral. Most of the navy and aqua is from my stash, but all that coral is new. I didn't have any in my stash. Now to decide what to make! Lovely selection :o) I've chosen this combo, along with some mustard and teal for my Brit Bee medallion quilt this year, but the coral has been challenging me too! 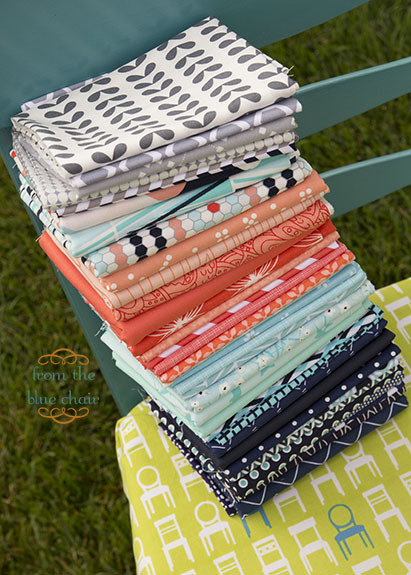 Gorgeous selection, not matter what I've no doubt you will make a beautiful quilt! pretty stack! i'm not much of a coral fan myself but i recently made a top using it as an accent. i find it's a difficult color to order online--some fabrics are too peachy, too orange, or too pink. getting it just right is hard! Lovely fabrics! I'm sure it will be an awesome quilt! i LOVE these colors! I'm working on an EPP pillow with them. I can't wait to see what you do with this! It's a gorgeous stack! Maybe not the colors I would have thought to pick for myself, but when you put them all together like that it really makes me think twice! This quilt is going to be beautiful! A great new color combination! Most of the time you see aqua and coral, no navy or gray! Anxious to see the finished product! Hi Kati! Beautiful bundle! I don't have either any coral - I don't like peach or salmon colour but I like those you have there. I think they are beautiful because they have also white or stronger 'red'. Difficult decision to choose the pattern! Any ideas? I got one quilt book from a friend and for my surprise I start to think I could make a quilt with some traditional blocks. With modern fabrics it could be fun. Whatever you decide to do with those, they are some great colors together! Hello,have great fun making your Sister's gift! Great colors. I can't wait to see it. LOVE the fabric choices and colour combo! Can't wait to see the finished product! Wow, cool colors. Your sister has good taste! Please let us know what you make from those yummy fabrics. I too was asked to make a quilt with corals, and aqua-blues. I just used the 6" Hex n' More to make a hexagon quilt. It looks really nice, if I do say so myself. That is such a delicious colour combo! What is that hexagon fabric? The Pixelated Color Wheel Quilt is home!